Nov. 16, 2018, is the 85th anniversary of an event that most Americans have never heard of. As I argue in my book, “American Betrayal,” it’s the seminal event in modern U.S. history. 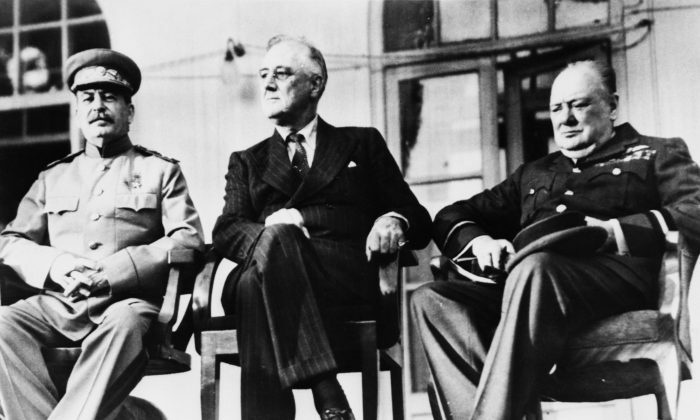 On this day in 1933, President Franklin D. Roosevelt extended “normal diplomatic relations” to the communist dictatorship under Joseph Stalin in Moscow. In exchange for a page of Soviet concessions signed by Foreign Minister Maxim Litvinov (who, with Prohibition-era beer on his breath, returned to the Soviet Embassy “all smiles … and said, ‘Well, it’s all in the bag; we have it’”), the U.S. government found itself derailed onto a strange, new track through an unfamiliar, soon monotonous, land of endless apologetics. The crux of the U.S.–USSR agreement rested on a series of promises, accepted and signed by Litvinov, that listed very specifically what the Soviet Union would not do “in the United States, its territories or possessions”: Namely, it would not attempt to subvert or overthrow the U.S. system. The declaration “scrupulously” stated the USSR would refrain and restrain all persons and all organizations, under its direct or indirect control, from taking any act, overt or covert, aimed at the overthrow or preparation for the overthrow of the United States. It further specifically stipulated that the Soviet government wouldn’t form or support groups inside the United States—such as the Soviet-supported Communist Party USA, myriad “front groups,” the Soviet-directed underground espionage networks spies that Elizabeth Bentley and Whittaker Chambers later broke with, or the Communist Party USA–Comintern group on the West Coast that Roosevelt-aide Harry Hopkins found out J. Edgar Hoover was bugging (and knowingly told the Soviets). The agreement, in other words, was a bunch of lies. As our most respected and beloved leaders increasingly sought refuge in this world of pretend, they led the nation on a disastrous retreat from reality from which we have never, ever returned. In our retreat, we left morality behind, undefended. “Four presidents and their six secretaries of state for over a decade and a half held to this resolve” not to recognize the Soviet government, Herbert Hoover, one of those four presidents, wrote in “Freedom Betrayed,” his monumental history of World War II and the early Cold War published posthumously in 2011. These U.S. leaders understood that the Bolsheviks’ seizure of the government by force, their reign of blood, and their pledge to conspire against other governments made the “mutual confidence” required for diplomatic relations impossible. Hoover, however, doesn’t explain the shift in thinking between 1918 and 1933. Indeed, who or what specifically inspired Roosevelt to undertake this momentous decision is largely glossed over in history, although Soviet recognition was loudly applauded by businessmen eager to sell their rope to Lenin. In his very first speech on his very first trip to the United States in 1975, 56-year-old Alexander Solzhenitsyn asked the question he had wanted to ask America most of his adult life. The renowned author of “The Gulag Archipelago” set it up by comparing the historic U.S. aversion to an alliance with czarist Russia to Roosevelt’s rush to recognize a far more repressive and infinitely more violent Bolshevik Russia in 1933. Pre-revolutionary executions by the czarist government came to about 17 per year, Solzhenitsyn said, while, as a point of comparison, the Spanish Inquisition at its height destroyed 10 people per month. In the revolutionary years of 1918 and 1919, he continued, the Cheka executed without trial more than a thousand per month. At the height of Stalin’s terror in 1937–38, tens of thousands of people were shot per month. The West’s decision to recognize the USSR—and its determination to keep recognizing it, no matter how much lying and acquiescence to the betrayal that entailed—did more to transform us than any single act before or since. The profound diplomatic shift—part Faustian bargain, part moral lobotomy—didn’t just invite the Soviet Union into the community of nations. To make room for the monster-regime, the United States had to surrender the terra firma of objective morality and reality-based judgment. No wonder, then, that tens of thousands of Dreyfus cases in Russia meant nothing to the “conscience of the civilized world.” Implications had already been officially sundered from facts. To be sure, there was something new in the way that recognition forever after reordered the priorities and actions of our republic, something that marked the beginning of a very new era. The fact is, the implications of normalizing relations with the thoroughly abnormal USSR didn’t just reward and legitimize a regime of rampantly metastasizing criminality. Because the communist regime was so openly and ideologically dedicated to our destruction, the act of recognition defied reason and the demands of self-preservation. Recognition and all that came with it, including alliance, would soon become the enemy of reason and self-preservation. In this way, as historian Dennis J. Dunn points out, we see a double standard in U.S. foreign policy evolve, and, I would add, in American thinking more generally. It was here that we abandoned the lodestars of good and evil, the clarity of black and white. Closing our eyes, we dove head first into a weltering morass of exquisitely enervating and agonizing grays. This is the journey that forced open our psyches to increasingly expansive experiments in moral relativism. Only a very few refused to go; only a very few saw the sin. He added, “Just before that happened, I was taken off to prison and my meeting didn’t take place.” Just before that happened, just before he was going to tell his U.S. compatriots the truth about Stalin, and about the Soviet Union, the 26-year-old was arrested by the People’s Commissariat for Internal Affairs for the most mildly derogatory statements about Stalin written in a letter. He was sentenced to a labor camp for eight years. Solzhenitsyn would have been too late anyway. Having abandoned the Western moral tradition as a precondition of the U.S.–USSR relationship, we already inhabited a brave new—and dangerous—realm. Wishful thinking was in. Evidence was out. Ideology was in. Facts were out. With an exchange of rustling paper at the White House, the revolution was here, the epicenter of American betrayal.